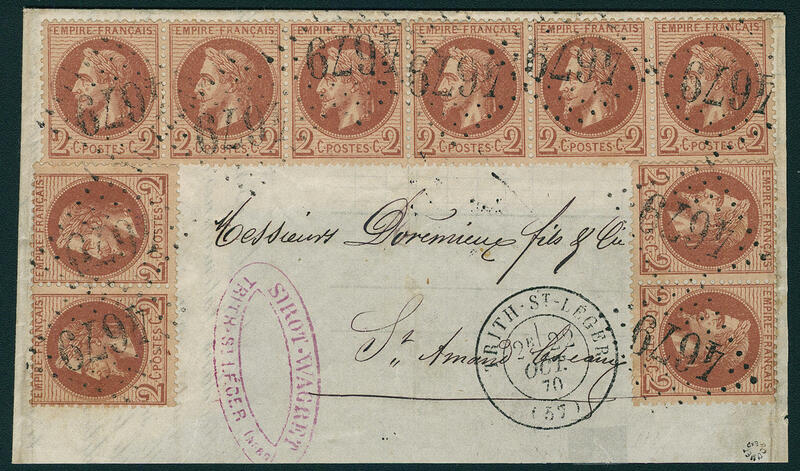 3706 ✉ 25 2 C. Red-brown, Napoleon, horizontal strip of six and two horizontal pairs as wonderful fresh and especially decorative and scarce mass franking on cover (back side not complete) with clean mounted number postmark \"4679\" and clear additional two ring cancel \"TRITH-ST. I. EGER 29. OCT. 70. \". A wonderful document! Photo expertize Roumet. 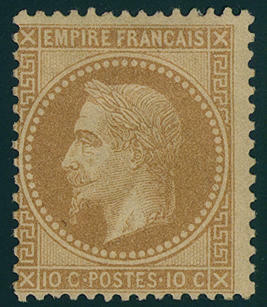 3707 27 10 C. Napoleon III. 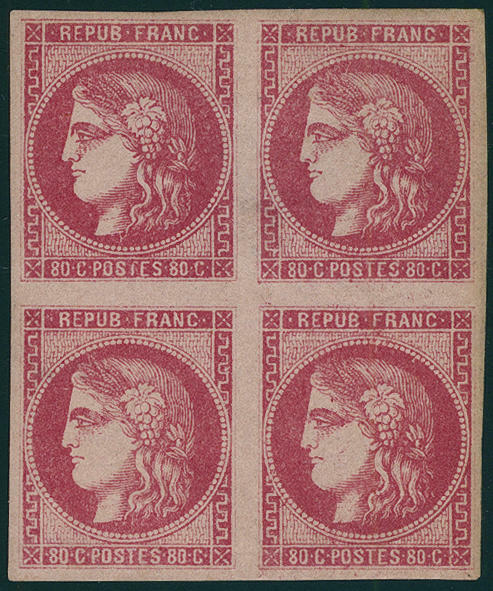 \"LAURÉ\", the scarce colour (bistre) in the horizontal strip of four from left margin, wonderful fresh colors, two values above a little irregular perforated, otherwise in perfect condition unused with original gumming. A particularly beautiful and very scarce unit for specialists! Photo expertize from the Weid. (Yvert-no. 28 A, Ceres-no. 28 I, 2400,- €). 3708 27 10 C. Yellow brown, fresh colors and very well perforated, in perfect condition unused, photo expertize Eichele. Michel 300,- €. 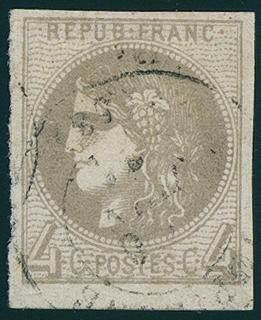 3709 ✉ 29a,GB16 30 C. Brown, right above tooth deficiency, on small-format cover from \"ARGELES 20.3.72. 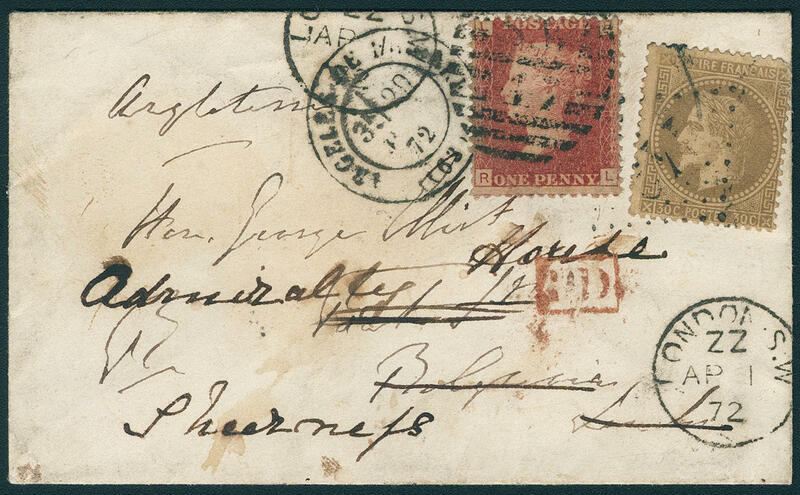 \" to London and there postage stamps added with 1 P. Red (plate 148) with duplex stamp \"S. W. 17\", forwarded to Sheerness. Attractive and scarce combination! Photo expertize Eichele. 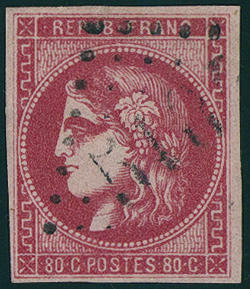 3710 ✉ 34a 20 C. Ceres, fresh colors and in perfect condition on very nice small-format balloon mail letter with red single circle postmark \"PARIS 28. 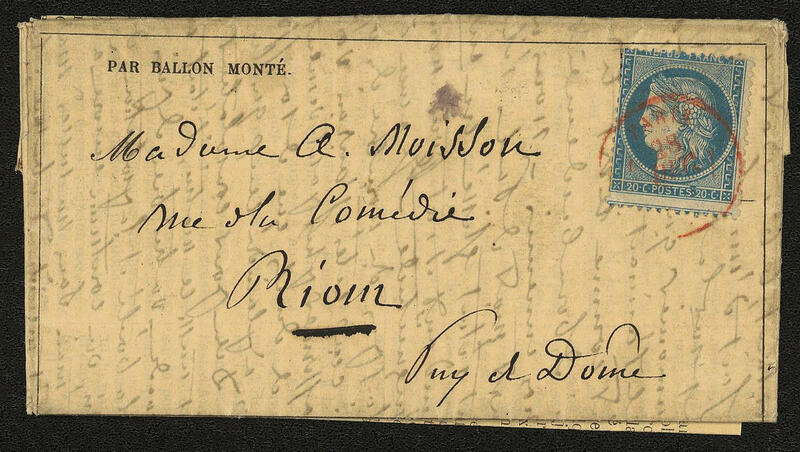 DEC. (1870) \" to Riom with arrival postmark, transported with the balloon \"LE BAYARD\". 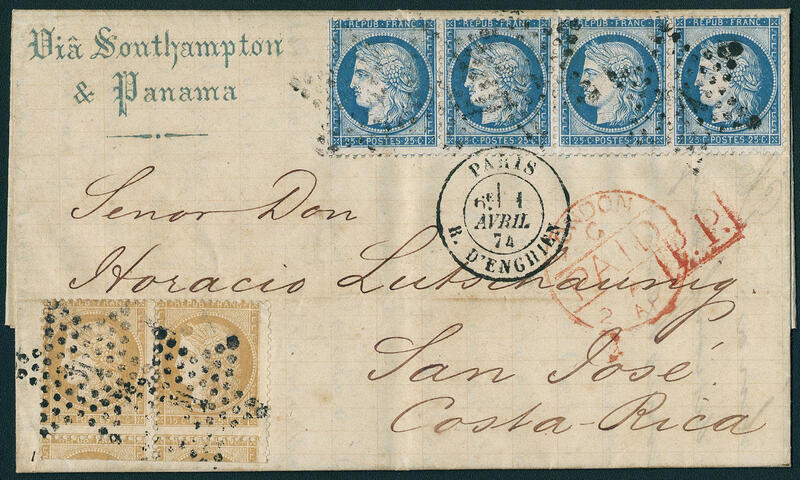 A very nice balloon mail letter from the captured Paris with attractive red cancellation! 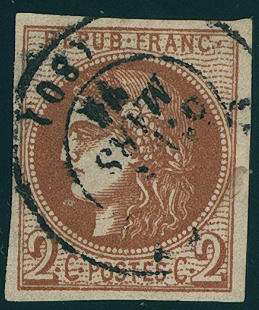 3711 ✉ 35,52,55 40 C. Orange, issue 1870, in mixed franking with 80 C. Carmine, issue 1872 and 10 C. Brown on rose, issue 1875 (at the bottom on the right round corner) as wonderful fresh three color franking on very nice cover with two ring cancel \"BORDEAUX\" from 1876 to Santa Ana / salvador, over England and Panama used. 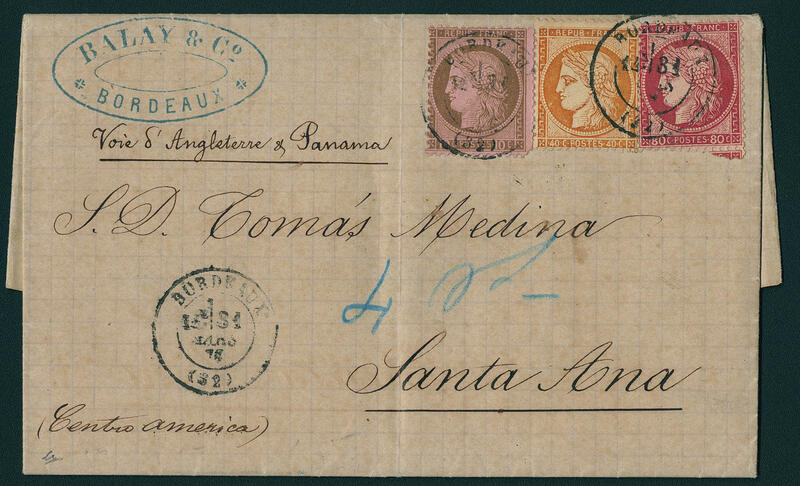 An extremely decorative cover with very rare destination! 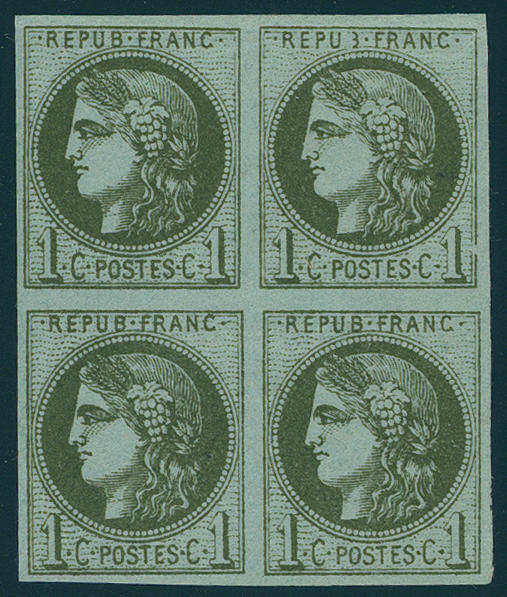 3712 / 36 1 C. Olive green on bluish, a wonderful block of four, wonderful fresh colors and large margins all around, in perfect condition unused with original gumming, a value even in perfect condition mint never hinged an outstanding quality of this rare unit for the highest standards! Photo expertize Roumet. 3714 ⊙ 37a 2 C. Brown red, having bright colors and neat cancelled extremely fine copy. Michel 250,- €. 3715 ⊙ 38a 4 C. Grey, having bright colors and with wide margins used extremely fine copy, expertized Buehler BPP. Michel 250,- €. 3716 ⊙ 38a 4 C. Grey, having bright colors extremely fine copy with clear number postmark \"2383\", signed Gebruder Senf. Michel 250,- €. 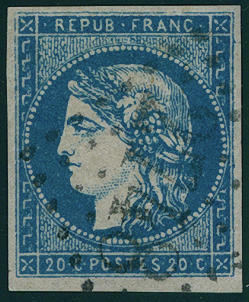 3717 ⊙ 41I 20 C. Blue, the scarce type I, having bright colors and piece in outstanding quality with enormous margins with clear mounted number postmark \"2748\". Michel 750,- €. 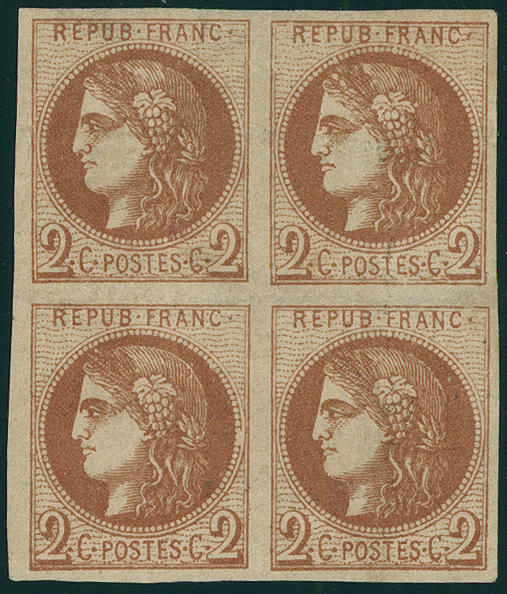 3718 44a 80 C. Rose, Bordeaux issue, wonderful block of four, wonderful fresh colors and with wide margins, in perfect condition unused, expertized Brun. Michel for normal stamps already 3000,- €. 3719 ⊙ 44a 80 C. Rose, having bright colors used extremely fine copy, expertized Buehler. Michel 300,- €. 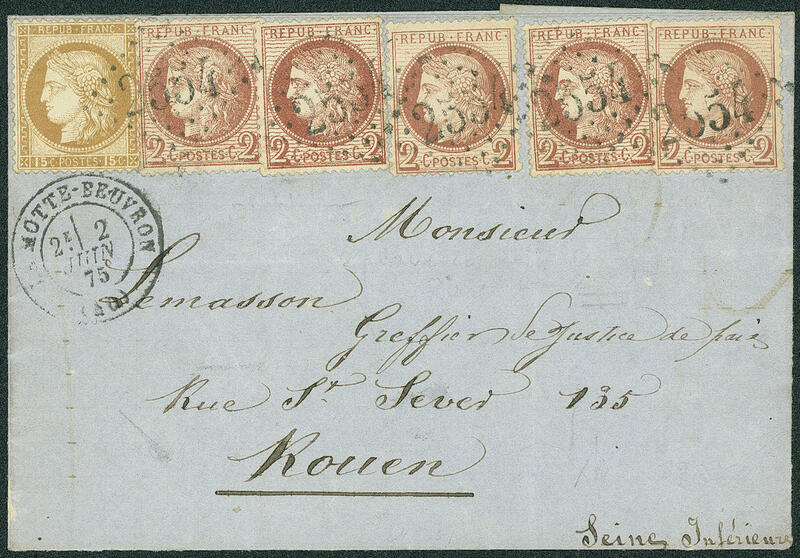 3720 ✉ 46,5 2 C. Red-brown respectively brown red, five examples in different color shades with 15 C. Yellow brown as very nice, faultless franking on cover with clean mounted number cancel \"2554\" and additional two ring cancel \"LA moth BEAUVRON 2. JUIN. 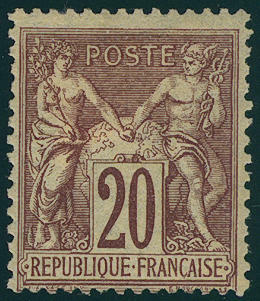 75\" to Rouen with arrival postmark. A particularly beautiful and scarce combination, the associated with the different color shades especially attractive becomes! 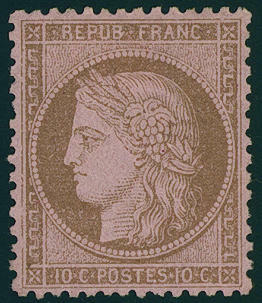 3721 49 10 C. Brown on rose fresh colors, very well centered, in perfect condition unused with original gumming. Michel 360,- €. 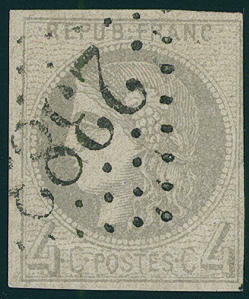 3722 ✉ 50,51 15 C. Yellow brown in the horizontal pair and 25 C. Pale blue in the horizontal strip of four, wonderful fresh colors on very nice cover with star number cancel \"4\" and turning into two ring cancel \"PARIS 1. AVRIL. 74. \" with additional two-line cancel \"VIA SOUTHAMPTON & PANAMA\", as well red transit cancellation \"LONDON PAID\" and red box cancel \"P. P. \" to San José / Costa Rica with complete content. A wonderful cover with an extremely rarely South America destination! 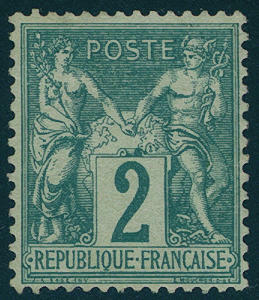 3723 57I 2 C. Green, the scarce type I, fresh colors, very well perforated, in perfect condition unused with original gumming. Photo expertize Jean-Francois Brun / International Association for Philatelie Experts. Michel 1600,- €. 3724 62I 20 C. Red-brown on yellowish, type I, fresh colors and in perfect condition unused. Michel 600,- €. 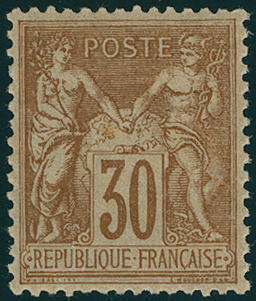 3725 64II 30 C. Brown, type II, wonderful fresh colors and very well centered, in perfect condition mint never hinged, without any signs.